though environment-related issues and crises have been repeatedly highlighted by the media in Pakistan, not much has been done to improve the situation. And it is unlikely that the forthcoming elections in the country will make any difference. Benazir Bhutto's Pakistan People's Party's manifesto, which is the most articulate on the subject, contains an entire page about its environmental programme. Non-governmental organisations in Pakistan have off late praised Bhutto's clear elaboration of her agenda with respect to other related sectors such as health, agriculture and industry. But her political rivals like Imran Khan (Tehreek-e-Insaaf party) and Nawaz Sharif (Pakistan Muslim League (Nawaz) party) seem to have devoted a paragraph to the subject, to 'ritually' commit themselves to it in their respective manifestos. The ouster of Benazir Bhutto's goverment in November 1996 and the current political instability has thrown the country's green agenda into disarray. The caretaker government, which subsequently took over has shown absolutely no interest in environmental issues. It has failed to enforce the National Environment Quality Standards (neqs) -- a set of environmental standards imposed on 50,000 industrial units in the country that were operationalised by Bhutto's government last year. Although Asif Zardari -- the husband of Benazir Bhutto -- lost interest in environmental issues after his appointment as minister of investment in mid-1996, his tenure as chairperson of the Pakistan Environment Protection Council (pepc) was the only period which witnessed action on the environmental front. Given the fact that the interest of Pakistani politicians in the environment has been by and large highly cosmetic and restricted to tree-planting drives, Asif Zardari was the first person to have shown an active interest in the subject. Scale of the problem The indifference of the establishment stands out in sharp contrast to the extent of degradation of the country's environment. 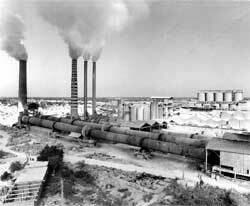 Five thousand industrial units have been identified as the major sources of pollution. Most of these do not treat the wastes generated and have done nothing by way of introducing better production processes, waste recycling or end-of-the-pipe treatment methods. In Karachi (the country's commercial capital), 2,500 industrial units release 67 tonnes (t) of hazardous wastes, which are either dumped into the sea and on land, or burnt in open air. Environmental problems in Pakistan have been allowed to mushroom as the country has taken long to constitute the institutional structure by which to enforce environmental laws and statutes. The pepc-- a high-level decision-making body -- was constituted only in 1984 as per the Environmental Protection Ordinance (epo) of 1983. According to the epo, the pepc is supposed to meet at least twice a year, but its first meeting took place only in 1993. Similarly, the director of the Pakistan Environmental Protection Agency (pepa)-- which was formed in 1983 and mandated under the epo to execute policies laid down by the government -- was appointed only in June 1992, just before the Earth Summit at Rio. It was only in July 1994, that the President, Farooq Ahmed Leghari, issued an ordinance to amend the epo and empower the pm to be either the chairperson of the pepc or nominate a person of repute for this office. Such an amendment was needed because when the epo was promulgated in the '80s, the country had been under military rule and the President was nominated as the chairperson of the pepc. Finally, on July 21, 1994, Benazir Bhutto, the then pm, chose Zardari for the post. Zardari's appointment rejuvenated the pepc. It held a record five meetings within a span of a year and a half. Zardari was more motivated towards environmental action than any other politician, including Bhutto herself. It was during his tenure that the pepc embarked on the Great Leap Forward Policy. Although the policy sought to rally a number of groups like school children and corporate houses to promote a more eco-friendly lifestyle, its main focus was to enhance the forest cover of the country. Pakistan is a predominantly agrarian country with only 4.7 per cent of its area under forest cover. Attempts were also made to protect the existing forests. A major step in this direction was the move to save juniper forests. These forests in the Ziarat valley of Baluchistan province are spread over 915,530 ha and are the second largest in the world, after the one in Anatolia, Turkey. Gas stoves and cylinders were distributed free of charge among the poor living in the vicinity of the forests. This was ostensibly done to cater to the people's domestic fuel requirements. But the sustainability of such a strategy in the future is doubtful. The region's population is bound to grow and there is no provision to provide either new stoves and cylinders or subsidies to potential new consumers. Another measure was the green facelift given to the federal capital of Islamabad. For the first time, a task force was constituted to check pollution in the Rawal lake, a drinking water reservoir. A plan to privatise the Capital's waste management was also chalked out. Steps like checking vehicular emissions, a ban on the import of plastic scrap and discouraging the use of polythene bags were also taken. However, all these measures have been Capital-centric, while pollution is a curse that hangs over the whole country. The draft of the Pakistan Environmental Protection Act 1996, was also finalised. This is the first instance of environmental legislation in the country for which various concerned persons have been properly consulted, with the draft being circulated among them for their approval. Under the neqs, which came into force on July 1, 1996, 50,000 industrial units were asked to adopt environment-friendly practices and an environment impact assessment (eia) was to be conducted on every unit that started production on or after June 30, 1994. The initial form in which the neqs were to be enforced seemed far too impractical to industrialists. The chairperson of the Pakistan Tanners Association, Khawaja Abdullah, feared that the enforcement of the standards would put industries under excessive pressure and hardship, have an adverse impact on exports and could even lead to the closure of factories. The Federation of Pakistan Chamber of Commerce and Industry (fpcci), which initially asked for an extension of the neqs deadline, was later able to negotiate a progressive and less stringent approach to their implementation with the pepc. Under the negotiated approach, proper search warrants were required for entry into any hazardous factory's premises. The penalty on polluters was to be doubled every year, beginning with a nominal fine during the first year of the enforcement of the neqs. The fpcci was also keen to convince policy-makers that the neqs should not end up as yet another means of extortion in the hands of law enforcers. Other steps were promised to make the standards more benign. Public notices appearing in newspapers and other forms of media would forewarn defaulters. Also, the person against whom action would be taken would invariably be the chief executive officer of the unit. A copy of the warning issued to the polluting unit would be sent to the relevant trade and industry association before initiating action. The pepc even recommended that the neqs would be applied equally to both the private and public sectors because, despite the privatisation process, a large number of polluting units such as refineries are still under government control. The pollution charges would be increased successively in a manner such that they approach the average cost of cleaning up as early as possible. Once the pollution charge equals the average cost of cleaning up, it would ensure that those who do introduce greener techniques do not suffer in comparison to those who persist with polluting production methods. Despite such clarifications and concessions, the neqs have not really been enforced. Asif Shuja Khan, director general of the pepa, who alongwith the four provincial pepas was to supervise a four-tier monitoring system of the neqs-- including self-monitoring by industry, environmental audit, counter government and independent monitoring -- confessed that the technical skills at their command, needed for the enforcement of the standards, left a lot to be desired. Apart from the central laboratory for environmental analysis in Islamabad and smaller testing facilities in Punjab and the North West Frontier Province, a modern testing facility for Sindh had been approved. The fourth province, Baluchistan, has no such laboratory. The lack of infrastructure and technical facilities to implement the neqs, coupled with the prevailing state of political limbo, has almost grounded the effective enforcement of the standards. Some eias have been conducted but these have involved only the smaller units. None of the major industrial units have been taken on. Grassroots organisations in the country have been complaining about the irregularities in the eias conducted so far. No fines have been levied on the polluters. In fact, industrialists are asking for more concessions to import environmentally-friendly technology. Interestingly, the country is yet to devise ambient air quality standards and standards for water bodies as the neqs deals with only municipal and liquid industrial effluents, gaseous emissions and motor vehicle exhaust and noise. The caretaker pm Malik Meraj Khalid, is the current chairperson of pepc, which has not met since the change in government. The only programme in the social sector that seems to have met with some success is the Social Action Programme (dealing with health, sanitation and family planning), which is funded by the World Bank and faces heavy donor pressure. The neqs, however, is under no such donor pressure. Despite the impressive stack of official documents, there seems to be no visible impact on the social sector. Many of the country's environmentalists blame poverty as being the biggest polluter. As per the United Nations Development Programme's Human Development Index (1995), Pakistan ranks 128th among 174 countries. The country has a long way to go before it improves its position.